UPDATED: Sun., Feb. 10, 2019, 11:19 a.m. Hundreds of friends and family gathered Saturday to honor retired Spokane Valley Fire Captain Tim Cruger at his funeral following a procession of emergency response vehicles. 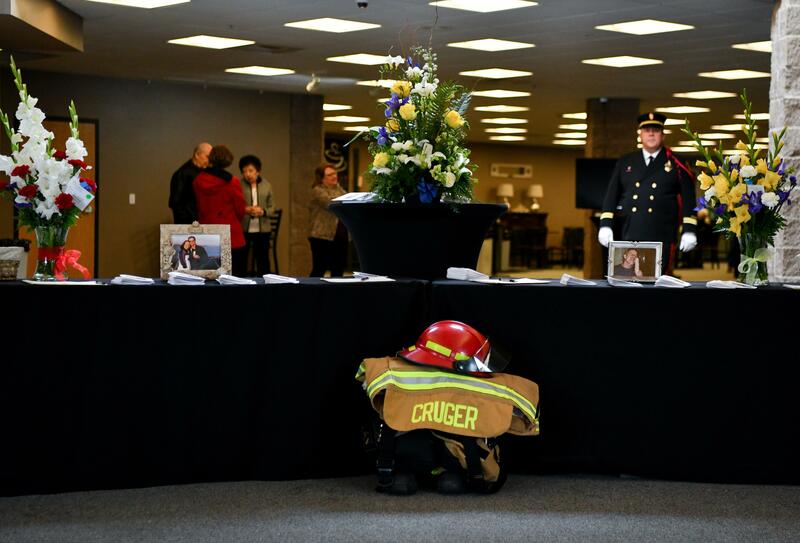 Cruger was one of two retired fire captains who died in December from a job-related illness from toxic smoke inhalation. A ribbon hanging from a flag at the funeral was imprinted with the name of the other captain, Dave Phay. Both fatalities were considered line-of-duty deaths. Snow from Friday night blew across the funeral procession route on Saturday, which included multiple fire engines and other vehicles. The procession began at Fire Station 7 and made its way to Spokane Valley Assembly Church. The snow and wind caused the procession to switch to a shortened route. In 1986, Cruger joined the Spokane Valley Fire Department and spent the remainder of his career there as an engineer, lieutenant and captain. He also led the water rescue team. Shortly after Cruger retired in 2015, he was diagnosed with kidney cancer, which metastasized to his colon, lungs and brain. Cruger was known for his sense of adventure. Friends and family remembered his love for skydiving, cliff jumping and water skiing. He also loved ice cream, evident from a picture on the back of the funeral flyer handout that featured Cruger licking a cone. Cruger, who died at 67, is survived by his wife, five children and 16 grandchildren. Published: Feb. 9, 2019, 4:46 p.m. Updated: Feb. 10, 2019, 11:19 a.m.